Our Graphic Designer has over a decade of experience and knows how to take the restrictions of the print environment to the edge. We are continually exploring new trends and staying on top of the game. We offer limitless solutions to your design needs and our services and skills are continually growing. Identity is more than just a logo. In fact, your identity extends to colour schemes, shapes and structure. The challenge in identity development doesn't just present itself to something unique, it requires simplicity, and something truly iconic. We offer the complete package for start-ups, a completely new identifiable logo with an accompanying style guide as well as the logo in various formats. We challenge you to find a design agency out there who can match our talents at a more affordable price. We also provide a logo and identity update service. If your logo is outdated or tired, we can develop and update it whilst keeping it in style of your current look and feel. Need a flyer? Something more? Perhaps a brochure? Have you ever thought to put your thoughts and poems into a book? It doesn't end there. We can produce magazines, end of year reports, catalogues, restaurant & café menus, and more! If you have a print requirement and need it to wow your readers, get in touch. We can provide you with the design service your publication deserves, and take it to print! Stationery is our forté. We've been taking care of our customers' business stationery since our inception over thirty years ago, and we probably have the best prices on the Sunshine Coast. Short runs, or long runs. We offer a selection of sizes, shapes, folded, foil, embossed, you name it. We aim to make our design match the personality of your business. 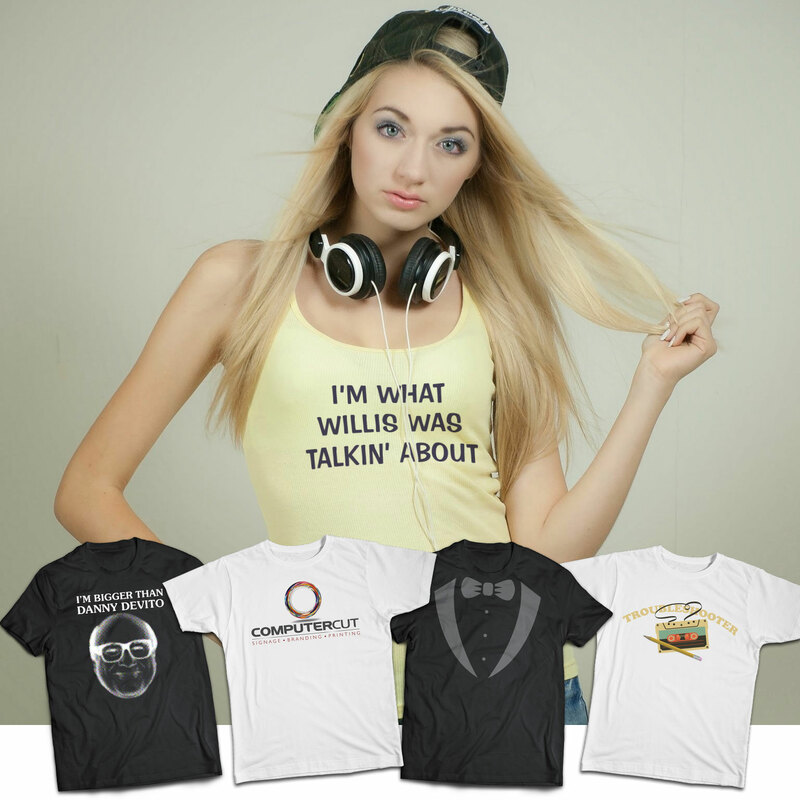 If your business needs uniforms designed, we provide custom designed apparel. More about this can be read at our Apparel page. Although sometimes it's not work related... Buck's or hen's night? A one off funny t-shirt idea? Minimum order of one! We have all the equipment and design skills required to make you a t-shirt, jumper, or even a cap that no-one has ever seen before. We provide high-end tees, jumpers and polos, but if you already have the clothing and/or image, bring it in to us! - we can apply your design right onto it. That's right - we may be a sign company, but we also offer web design services. Our skillset extends beyond just brochure websites, too - we can provide you with e-commerce solutions, complete with SEO. The websites we produce are affordable, beautiful and adapt to all screens and devices. If you're business needs a website, even if it's just a one-pager to get you found on the net, get in touch. You'll be surprised how easy it is to get the ball rolling. The website you're looking at now was created by us here at Computercut Signs Caloundra. 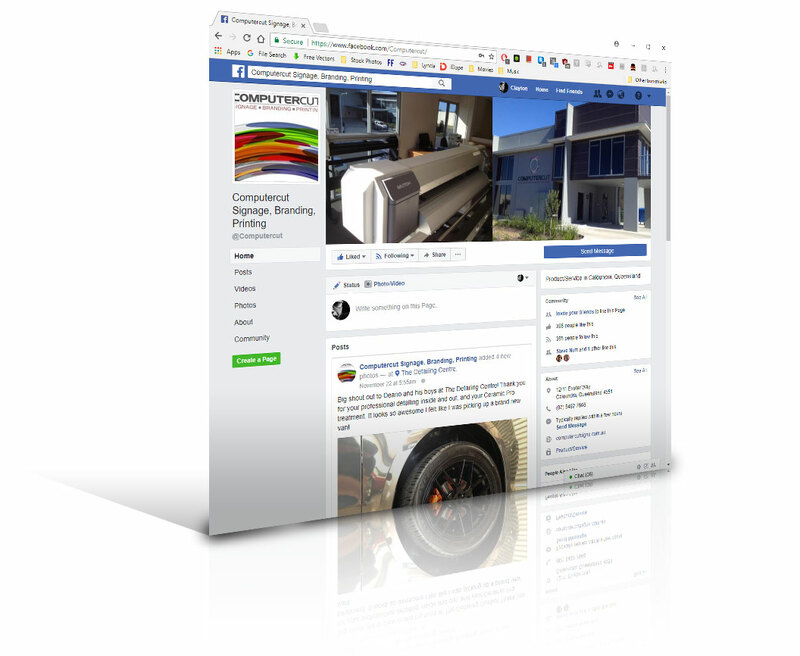 Does your business have a Facebook page? If you're in doubt how to get one up and running, we can assist! We've had plenty of experience in getting business pages together. Not only business pages, but also events and advertising. Without marketing how is anyone going to find you, or find out about your spectacular event?! We create graphics for ads, headers, profile pics and more. We also provide full video editing - complete with motion graphics, so if you want to start putting up videos so your followers can fully engage with your products and services call us today! Have a look at some videos we've done on our Portfolio page. If you have a business logo, why not use it in your email signature. We produce custom-designed email signatures for any kind of business. We're the experts in packaging design. We also provide custom designs for labeling, so if you have a product that needs to be on a shelf somewhere in the world, we can help. We provide eye-catching box designs, labels, and presentation containers. If you're thinking about running a campaign through something like Google Ads, get in touch. We adapt advertising designs to all sizes: square, small square, Banner, Leaderboard, Inline Rectangle, Large Rectangle, Skyscraper, Half Page ad and Large Leaderboard ads. We know what works when it comes to designing ads for your online ad campaign. If you're considering making your website available for Google Ads to feature, we can also provide you with the service you need. Get in touch - we're only too happy to help! Need design work? There's the button - contact us today!